Zeffer’s Apple Crumble Cider has flown out the door since launching last year – the rich apple and cinnamon aroma and freshly baked apple crumble flavour has made it a bit of a Kiwi classic. What’s more is this cider is perfect for serving mulled on a wintery day and very simple to whip up. Head cidermaker Jody Scott suggests warming the Apple Crumble Cider in a slowcooker which both mulls the cider and keeps it warm for hours. Add in a few extra ingredients and you have a great option for winter entertaining. You’ll find the recipe below. Fill a slow cooker or pot with Zeffer’s Apple Crumble Cider. Add the sugar, the sliced orange rounds, add finally the cinnamon sticks and star anise. Cover the pot or slow cooker and heat until the flavours meld. If using the slow cooker leave for 2-3 hours on low or warm. Serve in a glass or mug garnished with additional orange slices and cinnamon stick. 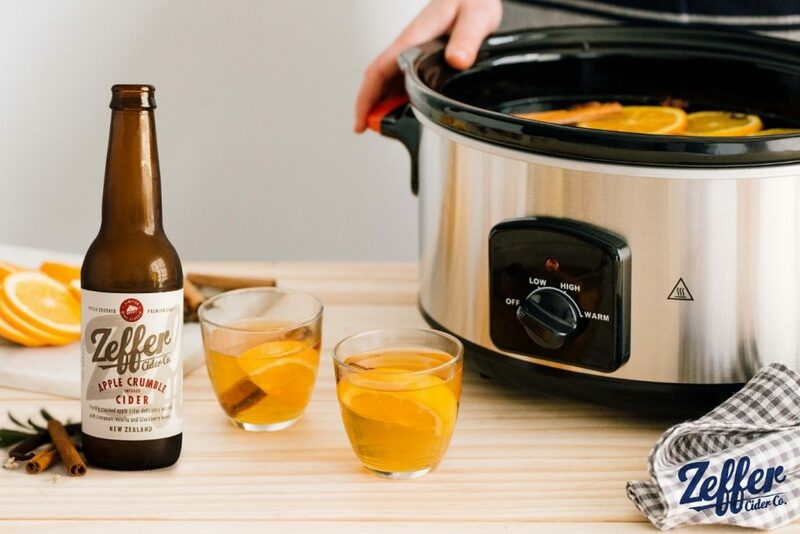 To find out how you could win a Mulled Apple Crumble Cider Kit which includes a slowcooker, glassware and ingredients, check out our Facebook Page.